Hillary Clinton, seen here at an event last month at the Center for American Progress, has an even chance of winning the general election at this point. Incumbency and Obama’s Approval Rating. Start with the fact that there’s no incumbent president running. There actually haven’t been a lot of cases that precisely meet the circumstances voters will face next year: Barack Obama, assuming he serves out the rest of his term, will become just the fifth president limited by the 22nd Amendment from seeking an additional term in office.1 Still, the evidence we have from presidential elections and from other contexts like gubernatorial elections is that these cases default to being toss-ups. Clinton’s chances will be affected by Obama’s popularity as he exits office. The relationship between the popularity of the previous president and the performance of the new nominee from his party isn’t perfect — Al Gore (narrowly) lost in 2000 despite Bill Clinton’s popularity, for example — but it certainly matters some, especially given that Clinton served in Obama’s cabinet. However, Obama currently has an approval rating of about 45 percent, and a favorability rating of 48 percent — about average, in other words. If those numbers decline into the low 40s or climb into the 50s, they could matter more, producing either a “hangover effect” or “halo effect” for Clinton. But don’t bet on this: Obama’s approval ratings have been extraordinarily stubborn for most of his presidency, rarely deviating much from the mid-40s. The Economy. I’d warn against simplistic economic “fundamentalism,” the notion that the economy is pretty much the only thing that matters. We’ll save the technical discussion for later, but because of a problem known as overfitting, statistical models that claim to make remarkably precise predictions about election outcomes from economic variables alone (without looking at polls) have a mediocre track record. Like Obama’s approval ratings, however, the performance of the American economy has been about average recently. GDP grew by 2.4 percent in 2014, adjusted for inflation, close to the historical average. Furthermore, we know relatively little about what economic growth will look like a year from now, when the general election campaign heats up. Historically, economists have shown almost no ability to predict the rate of economic growth more than six months in advance. The Electoral College And The “Emerging Democratic Majority.” What about that “blue wall” — the supposed advantage that Democrats hold in the Electoral College? Mostly, the “blue wall” was the effect of Obama’s success in 2008 and 2012, not the cause of it. If the economy had collapsed in the summer of 2012, Obama would probably have lost the election, and most of those blue states would have turned red. It’s true that in both elections, the “tipping-point state” (in both years it was Colorado) was slightly more Democratic than the country as a whole. That implies Obama would have won if the popular vote had been very close. But it would have had to be very close indeed — within a percentage point or two. That advantage is small enough that it might have been the result of circumstances peculiar to Obama and his campaign. If Clinton has an ever-so-slightly different coalition — say more working-class whites vote for her but fewer African-Americans — this small advantage could evaporate or reverse itself. (The Electoral College favored Republicans as recently as 2000, after all.) The same might be true if she isn’t as effective as Obama at mobilizing voters in swing states. Another theory — the so-called “Emerging Democratic Majority” — holds that demographic trends favor the Democratic Party. We’ll have a lot more to say about this theory between now and next November, but it’s probably dubious too.3 As Sean Trende has pointed out, it relies on a selective reading of the evidence — emphasizing 2012, 2008 and 2006 but ignoring 2014, 2010, and 2004. Perhaps more important, predictions made on the premise of “emerging” majorities have a miserable track record: Republicans were bragging about their “permanent” majority in 2004, for instance, only to get their butts kicked in 2006 and 2008. Nonetheless, the candidates matter less in U.S. presidential elections than in just about any other type of electoral contest. The reason is that the arduous, 50-state nomination process (and the “invisible primary” before it) screens out most candidates who would be huge liabilities to their party. An underqualified or unvetted or politically extreme or profoundly unpopular candidate might win one primary or caucus, but voters and the political parties will move to stop him in his tracks after that, as Republicans did to Newt Gingrich in 2012. Consider the three measurable factors that our U.S. Senate model uses to evaluate candidates. One of them is their qualifications on a 4-point scale as measured by their highest elected office, where the highest rating goes to those candidates previously elected as governors or senators. Almost all presidential candidates — including Hillary Clinton and the viable Republican candidates this cycle — rate as extremely well qualified by that standard. Another factor is fundraising, which is important unto itself, but also as a proxy for a candidate’s organizational strength. We’re not breaking any news here, but Clinton and the Republican nominee are going to raise oodles of money — probably in excess of $1 billion each, beyond what Obama and Mitt Romney did in 2012. That’s well past the point of diminishing returns. The candidates may struggle to make good use of all the money they’ve raised, in fact, and if one brings in 10 or 20 percent more than the other, it’s not likely to matter very much at the margin. The third factor is a candidate’s ideology as measured on a left-right scale. “Extreme” candidates (like Barry Goldwater) suffer an electoral penalty, while moderate ones (like Dwight Eisenhower) usually perform well. But nominees like Goldwater (or George McGovern) are rare. So are those like Eisenhower, for that matter. Usually a party nominates a candidate closer to the median of its voters and elected officials. That’s part of why Clinton is such a safe bet to be the Democratic nominee. Her political positions are essentially those of a “generic Democrat.” She’s neither a true centrist, nor extremely far to the left, so she’s not especially vulnerable to a challenge from either flank of her party. 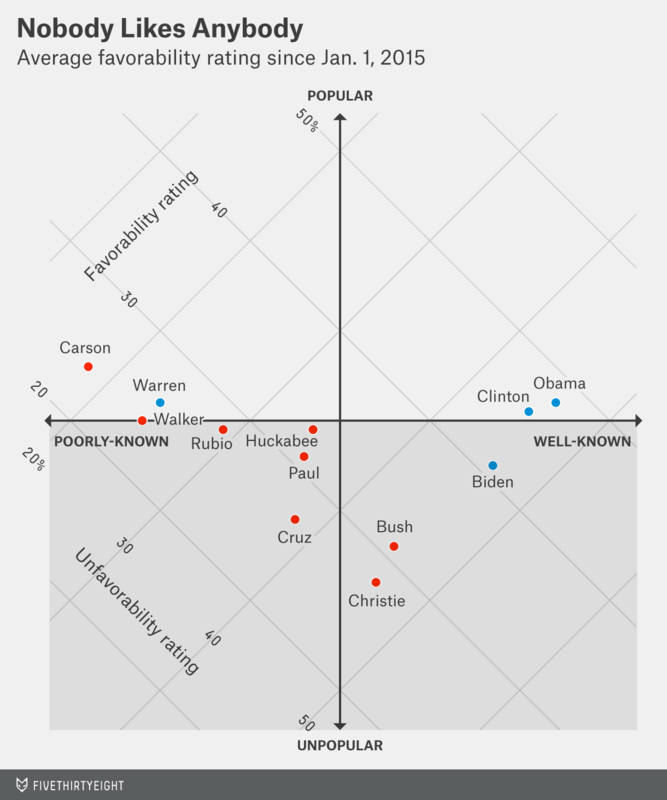 Republicans have a choice between more moderate and more conservative candidates. Jeb Bush’s positions might be just moderate enough to give Republicans a slight advantage next November, other factors held constant, while Scott Walker’s might be conservative enough that they could harm Republicans. But the positions of the Republican candidates are likely to converge toward one another. Bush, in the primaries, will seek to prove his conservative credentials, while Walker, should he become the frontrunner after the first few primaries and caucuses, will work to reassure GOP elites that he’s an “electable” alternative and not the next Goldwater. By next November, the difference might boil down to the equivalent of couple of percentage points on the general-election ballot. It could matter in an a close election, but not one where the fundamentals have shifted strongly to one party by then. In the chart below, I’ve compiled favorability rating averages for each candidate based on polls conducted since Jan. 1.5 The chart plots the candidates in two dimensions: the vertical axis indicates how popular the candidate is (how much the candidate’s favorable rating exceeds his or her unfavorable rating) while the horizontal axis plots how well-known the candidate is. Hillary Clinton is extremely well-known, but her favorability ratings are now only break-even: 46 percent favorable and 45 percent unfavorable. These are nearly identical to President Obama’s ratings, which are 48 percent favorable and 46 percent unfavorable. Clinton’s ratings are down sharply from her tenure as Secretary of State. However, as we’ve been warning Democrats for a long time, a lot of this was predictable. Clinton’s numbers have often been about break-even when she’s been a highly partisan figure — during the early stages of the 2008 campaign, for example — and better only when she’s been above the fray of day-to-day partisan politics. Clinton is so well-known, in fact, that it’s almost as if voters are dispensing with all the formalities and evaluating her as they might when she’s on the ballot next November. About half of them would like to see her become president and about half of them wouldn’t. Get ready for an extremely competitive election. Editor’s note: This article was updated to reflect Clinton’s announcement of her candidacy this afternoon. The others were Dwight D. Eisenhower in 1960, Ronald Reagan in 1988, Bill Clinton in 2000 and George W. Bush in 2008. This is slightly different from the case where an incumbent voluntarily declines to run again.Because incumbents are more likely to retire when they expect they might lose, these cases introduce the possibility of selection bias. Unless there’s a significant terrorist attack on the U.S. between now and next November, or the U.S. becomes embroiled in a major international conflict, the economy is likely to be the higher priority for voters. Even in 2004 — after the September 11 attacks and in the midst of the wars in Afghanistan and Iraq — only one-third of voters identified national security concerns as their top issue. In the 2004 national exit poll, 19 percent of voters identified terrorism as their top issue and 15 percent said Iraq. Even one of the original authors of the theory, John Judis, has now backed away from it. Media coverage of the campaigns can be highly personality-driven. Voters, by contrast, often have more substantive concerns. Which candidate they’d rather have a beer with matters less than the one they think will improve their job prospects. It’s also possible to go too far in the other direction. Some of the “fundamentals” models that I described before don’t look at any factors related to the candidates. As I mentioned, they’ve tended to do a poor job of predicting elections. They’re potentially making the mistake that baseball stat geeks did in the early years of the Moneyball “movement.” Because something is hard to measure (like positional defense in the case of baseball), it’s assumed not to matter. Later on, after better techniques are developed to study it, it turns out to have been quite important all along. I collected the data on Friday afternoon from Huffington Post Pollster. I used a maximum of one poll per firm, the most recent one, in the style of Real Clear Politics polling averages. My suspicion is that Bush’s poor rating partly reflects the association voters make with his brother, the former President George W. Bush, and that they may improve as voters become more familiar with his policy positions and personality. If they do not, however, Bush may lose any advantage from being perceived as an “electable” candidate, leading Republicans to nominate a candidate like Rubio instead.